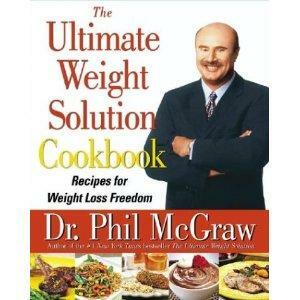 To promote his book, Dr. Phil sponsored a weight loss challenge during the 2003-2004 season of his show. He selected a group of people who were battling lifelong weight problems. Some were just 20 pounds overweight, while others needed to lose nearly 200 pounds. All of the participants had tried many other diet plans before appearing on his television talk show. Over the course of the season, viewers watched participants shed unwanted pounds by using strategies promoted in Dr. Phil's book. In the first six months, Ohio pastor Kevin Hannah lost 68 pounds. His wife Kim also dropped 50 pounds by following the program strategies. The couple's children, Ashley and Kevin Jr., lost a combined total of 50 pounds. Other participants reported similar success stories and inspired thousands of viewers across the country to begin their own weight loss programs. In his book, The Ultimate Weight Solution-The 7 Keys to Weight Loss Freedom, Dr. Phil McGraw offers dieters advice on winning the battle of the bulge. He lets his readers know that if they want to get the weight off and keep it off, they will have to change their lifestyle. Along with changing how you think and feel, he stresses the need to change how a person interacts with food and other behaviors. In his book, Dr. Phil explains, "You've got to change so many things, including your social system, your environment, all of these things have to be changed or it just simply doesn't work." Dr. Phil's weight loss plan blends nutrition, exercise, and basic psychological principles. He believes there are seven keys to permanent weight loss. Developing a positive self-image about your weight and your life. Understanding how your emotions influence your food choices. Setting up an eating environment that allows you to be successful in your diet. Learning to anticipate your food triggers while avoiding impulse eating. Replacing junk food with nutritious, healthy meals. Regularly engaging in some form of physical activity. Surrounding yourself with friends and family who are supportive of your weight-loss efforts. During Dr. Phil's challenge, he stressed the importance of setting realistic goals. For example, he stated it's not realistic for a middle-aged woman to aspire to slim down to her high school weight. According to Dr. Phil, choosing a goal weight that's not right for your age and metabolism sets you up for failure. During the much-watched television event, participants learned how to make good food choices. This recipe for Parmesan Popcorn was recommended as a tasty and healthy snack. Combine the Parmesan, parsley, oregano, basil, and garlic salt in a small bowl. Spread the warm popcorn on a large, rimmed baking sheet and sprinkle the spice mixture over it. Toss well and serve at once. Makes four servings. Dr. Phil offers more recipes for weight loss freedom on his website. While the The Ultimate Weight Loss Challenge television season has concluded, Dr. Phil hasn't given up trying to help others lose unwanted weight. He has published the Ultimate Weight Solution Cookbook that includes a variety of healthy and nutritious dishes that taste great. With more than 100 recipes created by chefs and nutritionists, this cookbook may be the recipe to weight loss success you're looking for .